After years of repeatedly installing and uninstalling my webers I have finally succeeded to get them running very well. With the help of forum member suggestions, internet discussions and Jim Ingleese pep talks and jets it wants to fly. Problems were probably made worse by attempting to pull vacuum of one of the carbs to power the brakes. Now an electric vacuum pump handles that. One issue remains. I drive the car an average of 750 miles a year. Is there any point in using air filters? Currently the stacks are protected by clip-on screens. Tom, if you're only driving 750 miles a year, one could probably make a case for using just the clip-on screens. But if that was my car, I'd probably install air filters, just to be on the safe side. I only have a carb, but I cleaned my K&N filter recently prior to a 1500 mile round trip trip to Washington and was amazed at how filthy it was. There is so much dirt sucked up from under the car in a Pantera I'd recommend filters, even if you are only covering low miles. Most road dust can be very abrasive. A good quality air filter is highly recommend. Do lots of research on what air filters are available. Bad air filter design or the wrong choice of filters can adversely affect the performance of your engine. You can use a filter IF you are using a "Weber" camshaft. 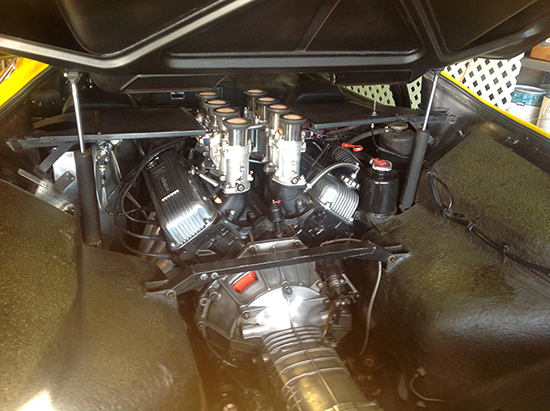 That camshaft will reduce and close to eliminate the blowback of the fuel through the carbs. If you are using a conventional camshaft you will get enough fuel blown back to saturate the filters and they WILL catch fire on a restart. They are also very restrictive and you will loose something like 80hp by using them. The compromise is to use screens on the stacks and you can get tricky by increasing the surface area of the screens from just flat. Believe it or not, the screens are restrictive too. The restriction isn't exactly equal to a direct proportion of the surface area of the screens, but it's close. If you double the surface area of the screens you reduce the restriction by 1/2. I know someone that drove a 289 Cobra, former Shelby factory race car on the street for 20 years with no air cleaners or screens. No issues. You just want to keep from sucking in big bugs, squirrels and stones. Small, slight build mechanics are also at some risk. My Std Warning on Weber air cleaners: do NOT use foam air cleaner elements with them, no mater what the factory says. Webers generate massive air pulsations thru their throats and will meter gasoline into an airflow going in either direction. This generates a fuel cloud standing above the carb throat(s). Foam air cleaners will almost instantly saturate with that fuel. Second thing about Webers is, they have no warm up chokes (they use a separate enrichment circuit) so they tend to backfire a bit thru the carbs until the engine is thoroughly warmed up. Even a small backfire can ignite a fuel-saturated foam air cleaner. When I was playing with Webers, I had two (2) engine fires from this in commuter traffic and only a passing 18-wheeler with a fire extinguisher saved the car the first time. It did cost me an engine.... The second time (6 months later) I had my own Halon extinguisher! I got rid of the factory Porsche air cleaners, too. the air cleaner fire MELTED a few carb's long narrow aux. venturis (made of low melting cast zinc). Molten zinc ran down the short intake pipes into one cylinder where the intake valve happened to be open. The next time that piston cycled up, the zinc had cooled into a metal lump which cracked a top ring and forged piston. Result was an overhaul plus one piston & set of rings. IMHO, a Halon fire extinguisher should be sold with each set of Weber carbs! Note- this dual-direction fuel metering does not happen with 8-stack EFI. Note- this dual-direction fuel metering does not happen with 8-stack EFI. What is the mechanism that causes dual direction fuel metering with the Webers, and not with the 8-stack EFI? The phenomenon described above is not unique to Webers and is called reversion. It is typically exaggerated by high overlap cam profiles. A similar event happens at the converging point of exhaust headers. Merge collectors help minimize that. Properly sized air filters cause minimal negitive back pressure (restriction). On the engine dyno my Weber equipped engine experienced no power loss with a well designed air filter system. The problem is that the space above the Webers in a Pantera is limited. The top of the air filter needs to be minimum 2.5~3 inches above the velocity stack opening and the air filters need to be properly sized. Agreed, stacks are the coolest looking. Nobody wants to mess with the aesthetics. There were many factory Weber equippped and aftermarket Weber equipped road cars on the street in past years. Not so much now. I don’t remember any fires directly caused by air filters. Could just be an age thing though. The carbs keep a constant cloud of atomized fuel in suspension in the carb throat. The fuel injection doesn't. It squirts a timed amount of fuel into the throat of the intake manifold. When the reversion wave pushes back, there is no cloud of fuel to be pushed out. Even Ford Escorts (the European rally car versions) were equipped with Webers. IR carburetion was standard fare amongst sports cars from the 50s through the 70s, although they all didn't necessarily use Webers (DellOrto, Stromberg, SU). Lets not forget sport bikes, with four down draft Mikunis or Keihins sitting under the fuel tank. How many twin cylinder motorcycles were equipped with two carbs? Triumph, BSA, Norton, Honda, etc. EVERY single cylinder engine has IR carburetion! Impossible for it to be otherwise. Not just motorcycles, but lawn mowers, generators, cement mixers, etc. These cars, motorcycles, etc. all ran and still run just fine. 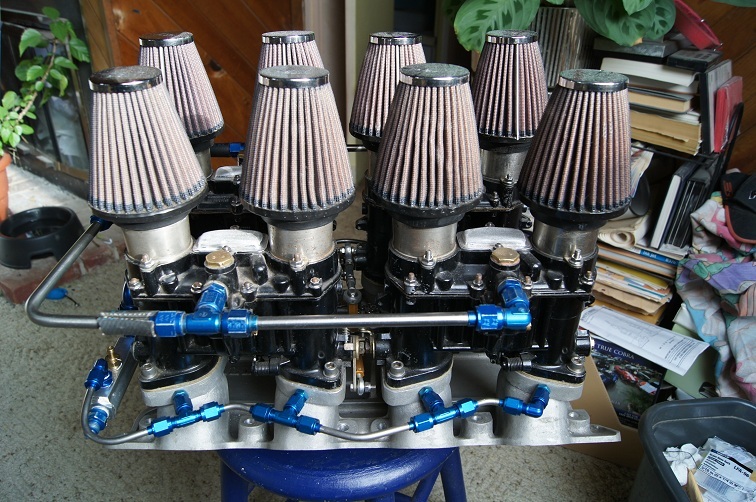 There is no argument that two, four, or six carburetors are more complicated to tune than a single carburetor. However there is nothing inherently faulty with IR carburetion. Whether or not problems shall arise is all in the execution. Food for thought. And all the factory IR carb equipped cars had air filters. What v8 weber ir engines had air cleaners? Look at the cam timing on 4 and 6 cylinder engines with ir induction. Which ones have overlap in cam timing? Which ones have 28 or more degrees of cam overlap? You won't have enough reversion at 28 or under to have any blowback. You actually can run the air cleaners on a stock cammed 351c because of the cam timing. You won't get much benefit because of the low valve lift but you won't get any blowback either. I made my previous comments knowing full well I was stirring the pot. The Maserati Bora (kissin' cousin of the Pantera} was equipped with a 4.7 liter V8 making 310 DIN horsepower at 6000 rpm. That's more horsepower per liter than the 1970 or 1971 351C. It was fueled by four - two barrel Weber 42 DCNF/14 carbs. Notice the factory air cleaner assembly in the attached picture. 28 degrees is a ridiculously small amount of overlap. Do you think any of those sports car engines had only 28 degrees of overlap? I can say with relative certainty they ALL had more than 28 degrees of overlap. Intake tract reversion is caused by the late "seated closing" of the intake valves, not by overlap. It happens when piston motion overcomes air column inertia. - two Weber 45 DCOE with foam air filters. NEVER had the slightest reversion or backfire. Thank you for the filter advice. I have the breadbox type filters but they look horrible, and almost not worth using at the risk of a rebuild. Is anybody using the thin foam filters that clip in like the air horn screens? 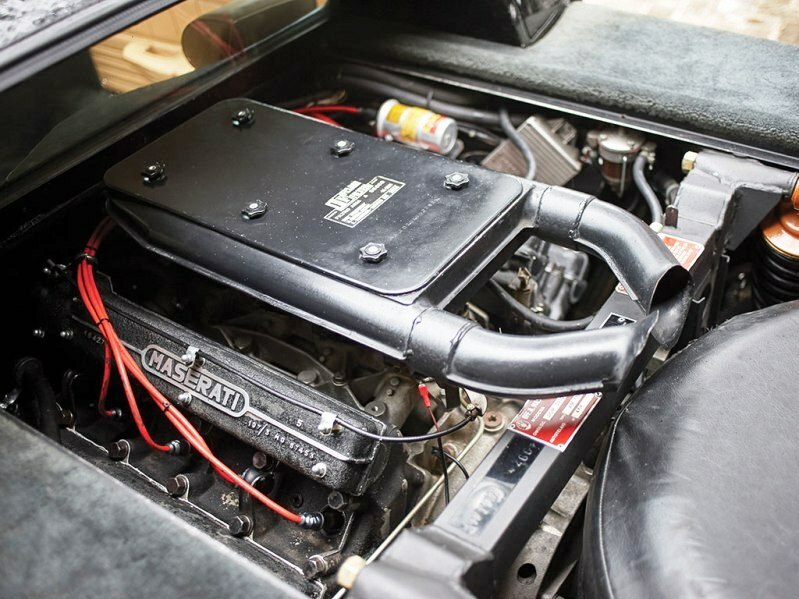 As for the valve covers, they were off the shelf in 70s, and probably still available, with the Detomaso logo casting machined into the louvers. I didn't read all of your replies until after I responded the first time. Excellent advice in total. Long ago I have witnessed the inversion myself. I had cut and installed thin foam filters to fit on top of the screens. Most of them got blown off during a short run, some were hanging on by a thread. I see clip on filters that have foam wedged between two screens eliminating this problem, but I hear from you that this might very well make performance suffer. Maybe I'll just clip on the screens when parked at shows to keep people from devious behavior. I tried these K&N's. They look good but are restrictive and you have to eliminate the reversion or else they will get soaked and will catch fire. Those are pretty much like putting corks in the bottle neck. A key phrase here would be the comment, "estimated 750hp". Estimated by who? Is this not a 427 SOHC engine? Here's a picture of his sign. Not my car, just what I saw at the show.